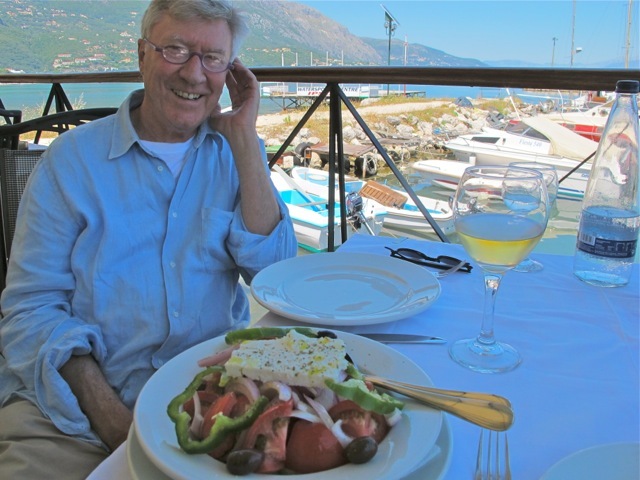 Greek Salad–a week of test drives! Red, pink, pale green, darker green, purple/black and white are the colors looking up at you from the bowl on the table. Add the dressing and turn the contents over and your fork will start jabbing in–involuntarily. Tomatoes, cucumber (peeled or unpeeled), peppers (red or green), sweet (red) onion, black olives, feta cheese, olive oil, red wine vinegar, salt & pepper. A glass of retsina, blue blue sky, a dry summer heat, a swimming pool or blue blue sea. The first nine ingredients are the essentials, the last five are preferable–but not obligatory–as they are not always available! It works best if the tomatoes and cucumber are sun-ripe and juicy but the contrasting tastes of the feta, the olives, olive oil, vinegar and seasoning make this national dish worth eating anytime, anywhere. Chunks, curls, slices and slabs lend a spirit of generosity to the brimming bowls presented here in Corfu. The olives here in Corfu are the kalamata variety, similar to the small black olives that feature in that other summer wonder–Salade Niçoise. Their faint bitterness balances the sweetness of the tomatoes and cucumber. The grilled sardines–small but meaty–arrived on a large plate, filling it from edge to edge. I put down the knife and fork in the end and ate them with my fingers. It took a while. 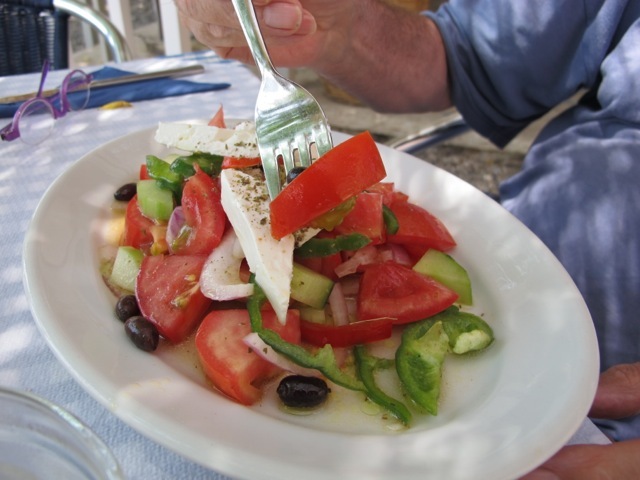 Greek salad would have made a simple, clean and contrasting accompaniment with or without the cheese–no room though! I was in Greece in 1982-it was the only time I lost weight on a vacation! Wonderful small cafe meals outdoors, fresh, perfect, especially with the last five ingredients! Although now I just can’t handle the heat. I adored Greece though. Have a wonderful time! Looks so delicious! Maybe I will have a salad for dinner tonight! Hope you are having a wonderful time Robin! Complimentary yellow on your color palette? I prefer Ouzo straight (no ice), the Greek wine I don’t like so much then I prefer The French or German-Austrian wine (mostly white) Cheer & enjoy! Dear Robin, Have a nice Holiday overthere, Greece is so nice and beautiful, was there in the late 80’s (Corfu).I suggest strongly try Swordfish with mediterian herbs grilled I had it several times overthere in a small restaurant.The owner showed me the fish where it came from (very big with yes the sword nose) and it was catched in the morning, well it looked very fresh and also the tast was exellent. 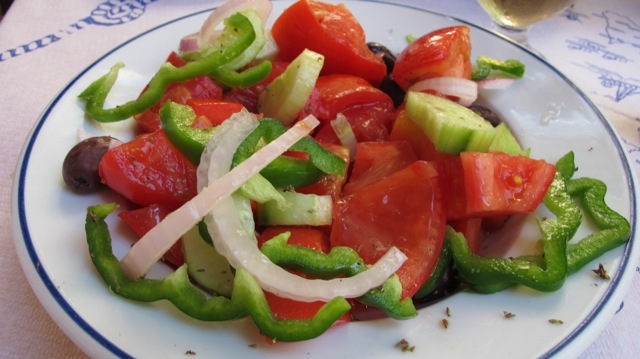 The Greek salat was also nice almost the same like you have on the photo, by the way very nice photo! Hughs, Chantal. Enjoy the rest!!! Beautiful colours and photos!! I was eating black olives yesterday from our local supermarket! Used to love eating them in Spain. on June 25, 2012 at 2:13 am | Reply Dianne P.
What a pretty place for lunch! And what great company! Gene says if you’re anywhere near the island of Rhodes, it’s worth a visit–one of the nicest places he’d ever been to. Rent a scooter, save us some black olives (my favorite!) & enjoy! Cheers & hugs! on June 25, 2012 at 7:39 am | Reply Caroline P.
Nice photo of you.. and before you it looks like an enormous plate full of delicious food! Enjoy the sun! I like the way the green pepper is cut! In Holland we call red/green pepper: paprika! If you say pepper(=peper) in our country you will always get the small hot(Chili) pepper! So watch out! Summer is the time for my signature Greek Salad here. All the ingredients you mentioned in your blog are present and accounted for and lie generously interspersed around a bed of fresh lettuce leaves that have been tossed and dressed with freshly squeezed lemon juice. The Feta Cheese, Olive Oil and Greek Oregano mixed together and then lined down the center of the salad in a large clam shell bowl, makes for a spectacular presentation at the table. Corfu looks beautiful. Have a wonderful time both of you. Oh, a glass of retsina can be devine! Kalimera, Enjoy the sun today (here in Belgium also sunshine finally)hughs Chantal. Hope you are relaxing and have great time. Here in Florence is too much warm with sultry heat… can’t wait to be in the week end to go in mountain for fresh and chilly air! Enjoy in wonderful Greek!!! Calimera,I recommend very much the place overthere paleokastrica and I must say it’s in my eyes the most beautiful place I’ve been in Europe. I really wished I could be there.Infact Greece was my first choise to emigrate but they don’t have my medicines overthere.They don’t sell coïdeine or Myolastan, furter more even a visit it is problems because those medicines I take I can’t take with me not even for a holiday overthere.Stange laws overthere even with medical evidence doctor papers.And say that the greek are the inventors of medical science Hippocrates. How do you make the dressing for your Greek salad? I’ve read several recipes and haven’t found the right one. Thanks. olive oil, red wine vinegar, salt & pepper. Ratio of oil to vinegar–3 to 1? tablespoons.